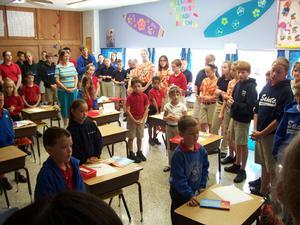 St. Joseph School students learn to develop a personal spirituality that helps them become aware of and respond to God's plan for their lives. Administration, teachers and staff understand that their work is a ministry to which they commit themselves. Joined together in a community of faith, they challenge their students to embrace the Gospel values that Jesus taught: faith in God, prayer and service, love and respect for self and others, compassion and responsibility, dignity and integrity, peace and justice. These values are not only taught in daily religion classes, but interwoven throughout every class and each day's activities. This integration of values and academics enables each student to grow as a whole person -- body, mind, and spirit.